In line with an effort to attract Muslim tourists to Okinawa, an increasing number of resort hotels and restaurants now offer halal food and accommodation, including the Hotel Yugaf Inn Okinawa in Nago City, which has recently been certified as Muslim-friendly by the Nippon Asia Halal Association. Hotel Yugaf Inn Okinawa provides a variety of services to ensure a comfortable stay for Muslim guests. Dishes prepared with halal-certified meat and other ingredients can be found at the hotel's breakfast and lunch buffets at all times. Two meal options, both consisting of halal items made with Okinawa's specialty products, are available for dinner. (Reservations required at least three days in advance for the halal dinner options and accommodation.) All halal dishes are prepared in full compliance with Islamic dietary law and using separate kitchen utensils from those used to cook non-halal dishes. In addition, special amenities, including prayer rugs, prayer timetable and a Qibla, will be provided to Muslim guests in their rooms. Besides Yugaf Inn Okinawa, Muslim-friendly services are also offered at the Kafuu Resort Fuchaku Condo Hotel in Onna Village, the Southern Beach Hotel & Resort Okinawa in the south of the island and a couple of other hotels, although they are not yet certified as Muslim friendly. Produced in accordance with the preparation and ingredient requirements of Islamic dietary law. Two Japanese-style course meal choices are available for observers of halal food practices. 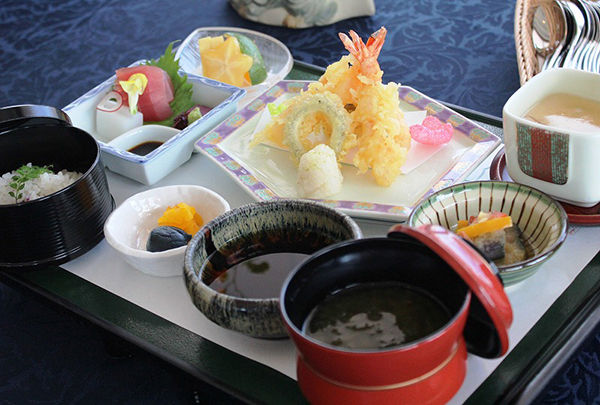 This course is composed of eight kinds of Japanese dishes including sashimi and tempura. This course features a total of 13 dishes, such as Okinawa's specialty peanut tofu, mozuku seaweed in vinegar dressing and stewed goya (bitter melon) in miso. The dishes may be served buffet style or at the table as a set meal depending on the number of guests requiring halal food. The hotel's breakfast and lunch buffets are always stocked with two or three halal dishes that can easily be distinguished by the special mark on signs accompanying the food. 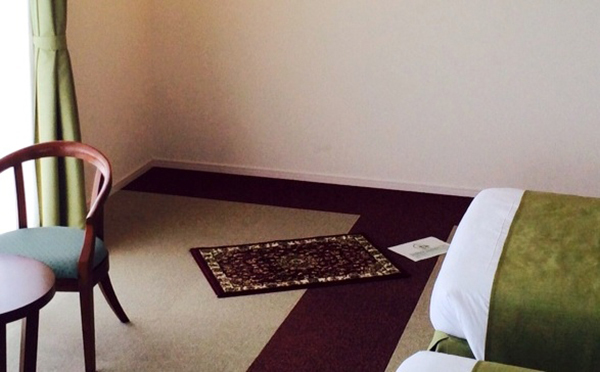 Prayer rugs, prayer time schedule in Okinawa and a Qibla will be provided in the guest rooms.